I am so excited to have the first guest post at Divya's Culinary Journey by wonderful blogger, Julie of Erivum Puliyum. I have a huge respect for her, for her guidance when I started taking baby steps in Blogging, also she is very friendly person. I love her blog which has a wide collection of over 330 recipes with lot of varieties. She is a dedicated blogger who updates her blog almost every other day, also when a fellow blogger posts a recipe she always stops by to read and comment. I really used to wonder, how she gets time for all this with 2 kids.This shows her dedication to blogging. She is also a creative person, who also has another blog, Beading beads. So when I thought about the guest post series, the first one to come in mind was her. Am so glad that she instantly agreed, when I requested her. It is a honour to have you here, Julie. Hearty Welcome to Divya's Culinary Journey! When Divya @ Divya's Culinary Journey asked me to join her guest post series starting off with me,I happily consented her.She is a very good friend of mine in the blogosphere.Her blog has many varied and beautiful collection of recipes.Thanx Divya for the wonderful oppurtunity and happy about this moment.And as always,I always celebrate my guest posts with something sweet,so does this .Sharing with you all,the tradtional sadya dessert and the preferred delicacy mostly in all sadya(banquet lunch) and marriage occassions is palada payasam(kheer).Palada is simply rice flakes made out of ground rice or rice flour.These are readily available in markets as palada.I have used here my home made ada recipe.You can use the store brought version too.The ada is then cooked in whole milk and it thickens in consistency,you get a light pinkish color.So,friends enjoy this yummy delicious kheer with your loved ones on any special occasions. In the meantime,heat the milk in a shallow pan and boil milk in it.Add sugar and let it thicken for about 30 mins.Keep stirring in between and keep on medium flame to prevent burning the milk at the bottom. Add cardamom powder,cover and put off flame. Heat another pan,add ghee.Fry cashews and then raisins.Add to the payasam/kheer. * You can use store brought ada packet.Just make sure to cook the ada before adding to milk. 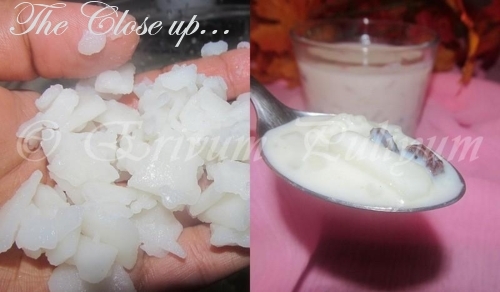 * You can add condensed milk to thicken the kheer but the authentic taste is with the whole milk thickened. It is an adorable dessert Julie. Looks too delicious dear. Thanks Divya for sharing this scrumptious dessert with us. 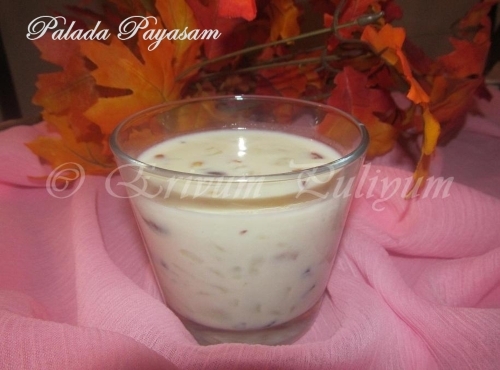 Yummy and delicious palada payasam. 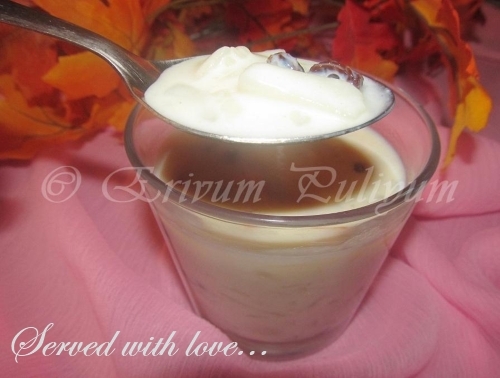 Delicious pal payasam Julie, Divya nice guest post. Congrats to both of you,delicious and super inviting payasam,my favorite. That's true what you said about Julie. She is a friendly person and a dedicated blogger. Even I wonder how everything works with her. Its hard for me to even post twice and feel bad when I don't go on everybody's blog regularly. Some bloggers might find it rude but I am not. I read each and every post and write my comment in detail. Hi Julie, if you are reading this your payasam sound delicious. I checked your 'Ada' recipe, it looks like lot of work for me.I wish I stay near you then you can help me out. Do you get banana leaves in the market?